More home-built boats begin construction in any given year then shop-built boats. And while many home-built boats are beautiful examples of marine craftsmanship the majority are never finished. Therefore it is essential prior to constructing your dream vessel to be totally realistic (or as realistic as one can be in a dream) to the costs and hours involved. Bray Yacht Design. 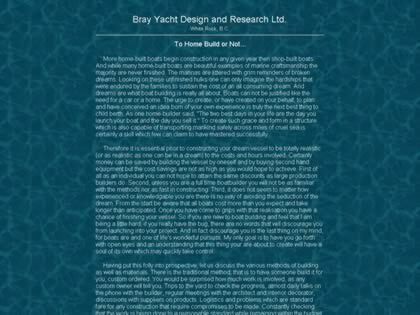 Web Site Snapshot: If available, above is a snapshot of the To Home Build or Not web site at http://www.brayyachtdesign.bc.ca/article_homebuilt.html as it appeared when this site was added to the directory or last verified. Please Note that Boat Design Net has no involvement with the above web site; all content and images depicted in the above thumbnail are the property and copyright of To Home Build or Not unless otherwise noted on that site. Description: More home-built boats begin construction in any given year then shop-built boats. And while many home-built boats are beautiful examples of marine craftsmanship the majority are never finished. Therefore it is essential prior to constructing your dream vessel to be totally realistic (or as realistic as one can be in a dream) to the costs and hours involved. Bray Yacht Design.